Genealogists love to share their research. Parents and grandparents love to share their children's works of art (even if that child is 48 and that work of art is a pedigree chart!) Sometimes the same old chart with the same old information just won't cut it. Are you looking for a new way to bring energy to your family history displays for yourself and others? Step outside the box and explore ways to share your knowledge through a non-traditional family tree. When most people think of displaying their family history, we picture a traditional pedigree chart. The only thing that may set it apart from another is the paper, font style, and frame. Generally speaking, the names and generations that are included remain similar to any other. Your research determines how many of these generations are there, but there they will be. These charts and trees are all beautiful, and a family historian should be proud to display them. Eye-catching display pieces share something that others don't, so flip your family tree on its head! Begin with your ancestors as the roots of your family and follow them up through the branches of your family as time expands your relatives. Instead of including only the usual suspects, consider including cousins, aunts, and uncles. We are used to seeing family charts that begin with one individual and move backwards in time. A unique family picture can be formed by starting at a different point of origin and including all lines, even collateral. Though this may work best with smaller families, it can still create an impressive picture where all positions are represented in a way that shows a family how it truly developed. In this tree, my parents are the center "trunk." It goes up to the top to my grandparents, with my uncles and their families down each side. Definitely not traditional! Marriage Records: How can you integrate the dates and locations of family marriages into your decorative tree? Perhaps you have wedding photos that can be used to bring faces to your data. Land Records: Is it possible to obtain a photograph of the family home or deeds for several generations of your family? These can be used together to share an impressive view of how each generation lived out their days. Military Records: Is there a family history of military service? Each branch of your tree could be represented by the active duty military personnel of that generation. Instead of limiting yourself to the standard vital statistics of name, birth, marriage, and death, consider including the military branch in which they served along with their rank, battles in which they participated, or other detail-rich material. As genealogists, we are used to programs, reports, and charts that follow the paternal lines through the generations. Consider highlighting the ladies in your family by instead following your maternal lines. This research may be a little harder to come by as you discover maiden name after married, but in the end it will create a family tree that focuses on often ignored ancestors. It can also give you a chance to highlight their unique gifts. Just as we looked at typically male-dominated traits such as military, identify the aspects of your female ancestors' daily lives that you'd like to remember. Do you have a family legacy of handicrafts? Share their creations by including samplers or photos of their works. Family memories are often tied to food. Share the recipe that each woman on your tree was known for - if you are lucky enough to know this information! In my family, we have a pecan pie recipe that was handed down from my great-grandmother throughout the generations. This would make a great backdrop for a tree about the women in my family. Many times people assume that women held the quiet roles in the family. Have you discovered some interesting positions, beliefs, or accomplishments in the lives of your female ancestors? Highlight them in a themed family tree chart. You can find more ideas for remembering the ladies in the article "Remembering Grandma: Sharing Stories of Your Female Ancestors." Does your family have a heritage of faith? In one of my family lines, we have one strong, repeating thread: a legacy of pastors and pastor's wives. I've been lucky enough to research within the stacks of our denomination's archives which opened up a wonderful, rich mountain of information about my ancestors' involvement in their respective churches. If you have a similar legacy, consider sharing it through a unique family tree by recording each ancestor that was a pastor, lay leader, or involved member of their church. Did your family travel the trails or immigrate from the Old Country? 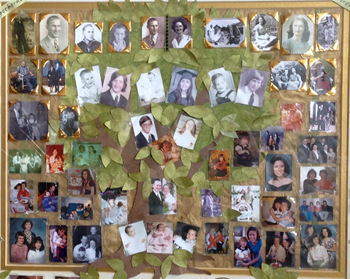 Decorative family trees can share some of the trials and triumphs of our ancestors by highlighting their travels. Consider showing the migration path that each ancestor took by integrating a map into your pedigree chart. Overlay photos at starting and ending points on the map. Or, include notes along the path showing where they stopped for marriage, illness, or burial along the way. Does your family have the team spirit? Many families have a legacy of attending the same colleges or universities. A fun way to share this aspect of your family history is to integrate school photographs that highlight each generation's attendance and contribution to an educational institution. If multiple generations didn't attend the same school, consider sharing photos that have a common thread such as high school graduations or team sports. It will represent their personality as much as the time period in your pedigree. Is your child a musician? Encourage them to discover the musical tradition of your family. Call relatives to ask what their favorite song was at your child's age, and then record it on your tree. For generations past, include an example of the music of the culture or "old country." Multimedia presentations can expand the idea behind a family tree to include additional photographs, soundtracks, or video to make your project come alive. Older children will enjoy diving into the technology available to make the project jump off the screen. For very young children, consider recording something relevant to their daily lives. Children identify with things such as family pets and favorite meals. The goal of a child's family tree can be as simple as sharing this information to create a common thread between households of cousins or within the generations of a grandparent and grandchild. And, they make wonderful décor items! Your family's history is unlike any other. Why shouldn't the way you display it be just as original as the stories contained among the generations of your family? The purpose of sharing non-traditional trees is to show the individual personalities that came together to create your unique heritage. No matter how you choose to share your family history with others, be sure to make it your own. By integrating your personality into your project you'll find a winning combination that will create a well-loved family heirloom. You just might interest others in their family history in the process! Martha Stewart's "How to: Hand-Lettered Family Tree"